This species was previously placed in the genus Omalus. Identification keys and general biology are given in Spooner (1954), Danks (1971), Morgan (1984) and Kunz (1994). Widespread from Cornwall to Kent and north to Westmorland and North Yorkshire. There are isolated records from Scotland (Fifeshire and Moray (the river Spey, near Fochabers; Shaw, 1998)). Also from the east coast of Ireland, and the Channel Islands. Overseas, the wasp occurs in Europe (including Norway, Sweden, Finland, Denmark, Belgium, France, Spain, Germany, Italy, Poland, Hungary, former Yugoslavia and Greece), north Africa, and Asia (including Russia (Daghestan), Manchuria, Korea and Japan). There have been some introductions into the USA. Found in the open habitats of its stem- and wood-nesting hosts. Usually associated with bramble, but also apple, elder, loganberry, oak, peach, raspberry, rose and willow. Usually June to August, but also May and September and rarely April and October. Danks (1971) found that the mean emergence date of eleven males was 23 June, a few days earlier than the mean emergence date of 27 June for 17 females. Apiaceae (including wild angelica and wild carrot) and mint. 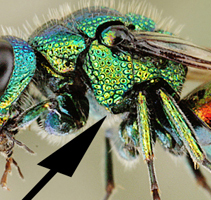 Berland and Bernard (1938) give information about chalcid and Ichneumonid parasites of this wasp in mainland Europe.